It was Christmas in Galicia. Jarl Rognvald was far from home, storming the walls of a Spanish castle. Taking stock of his rather surreal situation, he remembered the Christmas feasts that his cousin, Solmund, used to hold back in Agder. Solmund’s father, Sigurd, had a farm at Gjerstad. He was loyal to King Magnus Barelegs, and in 1098 sailed south to Anglesey, to support his Welsh conquest. Sigurd was fatally wounded in the ensuing battle and died there in Wales. Solmund grew up at Gjerstad and became a great chieftain. He kept on his father’s farm, but lived for the most part in Tønsberg, where he was appointed by the king as his agent. This town was home of the Haugating, one of the foremost assemblies in all Norway for the proclamation of kings. Tønsberg had always been a king’s town, and the prestigious royal mounds at Borre and Oseberg reminded Solmund that he held the most important seat in the country. Of this there is no doubt, however, a rival chieftain, Jon Petersson of Sogn, begged to differ. A bitter dispute arose as to which of them was the greater. It was a sordid affair, and after several killings King Sigurd Magnusson intervened to call a truce. That autumn, 1129, Harald Gilli arrived at court, claiming to be the king’s brother. King Sigurd talked the matter over with Solmund and his chief advisers. It was agreed that he undergo an ordeal to prove his claim. Undeterred, and unscathed, Harald convincingly walked bare-foot over nine red-hot irons in the Church at Sem. Afterwards King Sigurd went up to spend the winter in Oslo, where he fell ill and died. On news of his father’s death, Magnus was quickly declared king. Solmund, however, called the Haugating and proclaimed Harald king over half the country. The two kings tried to get along, but war was inevitable. On 9 August 1134 their armies came face to face at Färlev in Bohuslän. Solmund fought alongside King Harald, who had merely fifteen hundred men, compared to the six thousand that King Magnus had brought with him. It was a ferocious battle; the din of swords rang across the plain, which lay red, ‘drenched with warm blood.’ King Harald’s army was soundly beaten. Those that held out sailed south to Sjælland, and were welcomed at the court of King Erik Emune. After replenishing their supplies, they set sail with fresh troops, hugging the coast of Sweden until they reached the mouth of the river Glomma, to the south of Odin’s Island. King Harald’s men plundered as they went, killing those faithful to King Magnus. One of these loyal chieftains, Asbjørn by name, was thrown into the waterfall at Sarpsborg, which was considered to be a dreadful way to die. King Harald then sailed back over Oslofjord, to Tønsberg, with Solmund. 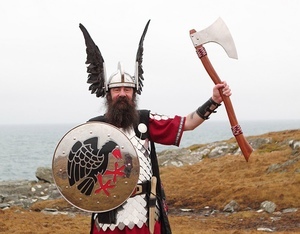 The following winter Solmund heard about the trouble Jarl Rognvald was having over in Orkney. Jarl Paul Haakonsson was defiant and averse to sharing the islands with him. Solmund agreed to help. When summer came they set sail, taking six galleys, and a band of Vikings, especially selected for the task. The fleet ran into a storm on their approach to Shetland, and took shelter in Yell Sound. This, however, was by no means an inconvenience to Solmund and his men. The farmers were delighted to see them, and kept them well entertained. Hearing that his rivals were busy feasting up in Yell, Jarl Paul sailed north. By night, under a shroud of darkness, he killed those keeping watch, and stole their galleys. Stranded, the cousins were forced to wait until autumn before hitching a ride back to Norway. Looking on the bright side, their trip had not been a complete waste of time. During the summer months spent among the Shetlanders they had made loyal friends, and firm allies. In the spring Solmund took a trip to Denmark to pick up supplies, before making the return journey to Orkney. Their fleet of fourteen galleys beached in the village of Pierowall, on Westray. Jarl Rognvald’s campaign was swift. He soon had the sworn allegiance of the Orcadians, aided perhaps by a little coercion; one or two had to be forcibly reminded of where their loyalty should lie. Solmund died back home in Tønsberg, but his legacy lived on after him. His son, Ivar, was father of the great chieftain, Orm Kongsmåg, whose mother, Queen Ingrid, was King Harald’s widow. Orm was a step-brother of King Inge Krokrygg, and later became, next to the king, the most powerful man in Norway.